Like I said before we are camped on the banks of the Cumberland River. I thought I would learn more about the area and what happens here. The Cumberland River is a waterway the southern Untied States. It is 688 miles long. 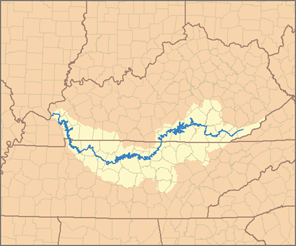 Its tributaries are three separate forks that begin in Kentucky. After flowing through Nashville, the river continues west through Tennessee and back into Kentucky at the Land Between the Lakes National Recreation Area. And Finally, the river flows north and merges with the Ohio River northeast of Paducah. America has nearly 12,000 miles of commercially navigable inland waterways that have been used for moving the goods of this nation for as long as it has been in existence. This natural resource contributes to the growth and efficiency of trade and commerce in ways that shrink our carbon footprint, reduce noise levels and congestion on our highways while improving profit margins. Movement of freight by barge is being considered anew by many companies for these very compelling reasons. Did you know that America moves over 600 million tons of freight by barge annually? This is the equivalent of approximately 25 million truckloads! The freight in one standard tow of fifteen barges being hauled by truck would result in a line of tractor trailers ten miles long! Overcrowding on our highways is already problematic. Imagine the additional congestion and wear and tear on our roadway infrastructure if not for waterway transport. The occurrence of accidents is also drastically reduced. Measured by a ratio of accidents to tonnage hauled, barge shipping is significantly safer than either rail or trucking. A barge is well suited for this task. A barge is a flat-bottomed boat, built mainly for river and canal transport of heavy goods. Some barges are not self-propelled and need to be towed or pushed by towboats. Got this pic of a barge going down the river right here. It looks like they are hauling coal. I have also been out taking pix of the area. Hope you enjoy. Dog violet is the common name for various species of the plant genus Viola with unscented flowers. The term arose to differentiate them from the scented sweet violet. Not sure, but I think these are apple blossoms. And of course the dandelion are out too. Bird watching is great fun, but bird identification is a lot harder. I have bird books and went on line and I am not sure if this is a Little Gull or a Bonaparte's Gull. I think it is a Little Gull. The next few pix are of one of them fishing. The trees are almost ready to pop too.